It's Spring and the nesting season has begun for many birds. 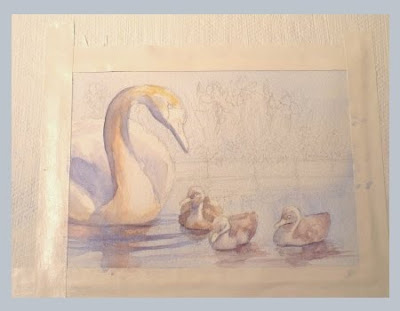 I love the graceful ballerina beauty of swans, so my demo painting today is of a mother swan with her little cygnets. 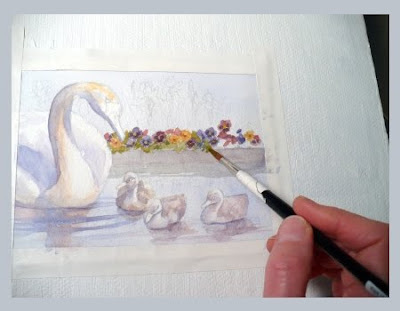 Above you see a 5x7 sheet of watercolor paper taped to a board with the composition drawn on it and a few soft washes of color to shade the birds and denote their reflections. I've also washed the background and water with pale blue. This painting is done by mixing a limited palette of one red, one yellow and one blue. I'll leave the swans as they are for now and paint in the background beginning with some colorful pansies blooming above a stone border. Some purple iris provide a background for the pansies. I can't forget the reflections of the flowers in the water, so those go in next. I also deepen the blue color of the water. 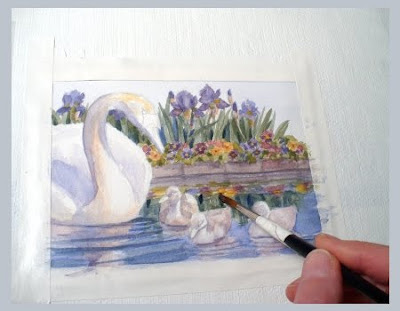 The flower reflections and the deeper water color will help the baby swans stand out. 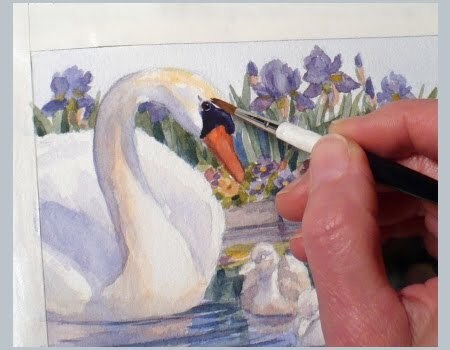 With a small fine-pointed brush, I paint the details of the swan's faces leaving a catch light in their eyes. The sharp contrast of black against white on the mother swan will help this to be the focal point of the painting. Now the swans are swimming happily in a garden pond. Even though the background flowers are colorful, the birds stand out because they are painted on white paper whereas the flowers are painted over a pale blue wash which helps them to recede. Notice what path your eye takes as it looks at this painting. 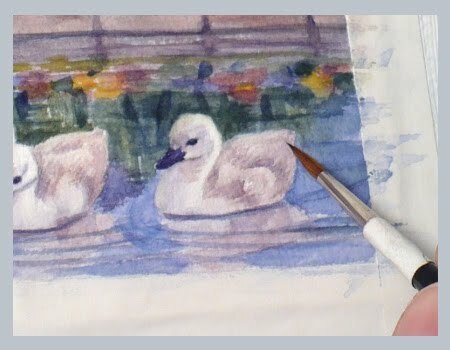 Most likely it will be drawn first to the mother swan's face, then travel to the cygnets, wander through the flowers and back to the mother - or in the other direction. This circular path was planned in composing this piece. I hope you enjoyed the demonstration! You can find more of my animal art and art for children at Zehland.Etsy.com. Thanks for posting another demonstration! I wouldn't have thought to make the flowers recede by painting them over a blue wash. That was completely new to me. I struggle with creating depth in my own paintings, and I think you've just given me a new key. Also, you're right about the eye path through the painting. 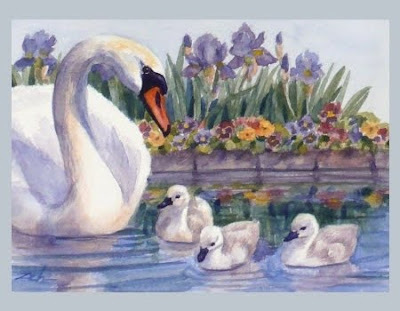 I first look at the mother swan, then the cygnets, then across the flowers back to the swan. Just remember what it is like to look at mountains in the distance. They look blue, don't they? This is due to the atmosphere. In painting, this is called Atmospheric Perspective - or how the atmosphere affects what you see. Things that are farther away have cooler tones. Things closer have warmer tones. Even yellow at a distance is a cooler yellow than up close. If you are using a palette with both warm and cool of each of the colors, you could use a cooler yellow for the distant objects and a warmer one for up close. But since my palette is limited to three colors, I must rely on the one cool color I have -which is blue - to create this effect.